A glorious distinctive fern, hardy in most parts of the British Isles and Ireland, also makes a tremendous house plant for cooler areas. Sometimes erroneously offered as A. aristata 'Variagata', this naturally variagated species will make an impact in anyone's garden! The photo shows the mature fronds, the creamy stripe lights up the fern or herbaceous border. 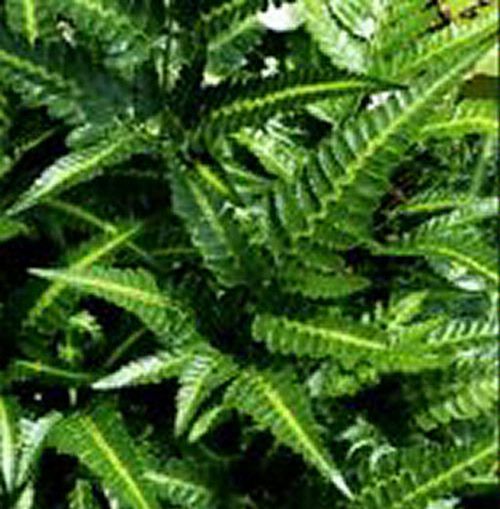 This fern enjoys partial shade or good light (not midday sun) and is surprisingly trouble free. The only annoyance is the taste of the new fronds is like manna for slugs! Once the fronds hardens it is of no interest to them but protection is advised for developing fronds.